Hollyburn Country Club, West Vancouver, August 5 - Frederic Niemeyer, above, of Deauville, Que., who is No. 2 in Canada, beat Sam Querrey of the U.S. 4-6, 6-4, 6-3 to take the Men's Singles title. Tennis Canada is handing wild cards for this week's Rogers Cup in Montreal to Canadians Niemeyer, Frank Davcivec, Peter Polansky, and Philip Bester (of North Vancouver). Photo 1 (left): The 6ft 6in Sam Querrey has rocketed more than 700 ranking places into the top 100 since last year. The San Francisco native beat fellow American Donald Young, 6-4, 6-4, in the first round. Donald, on the right, bottom photo, claimed the Wimbledon Jr. crown earlier last month. Photo 2: Defending champion Rik De Voest of South Africa failed in his attempt to win the tournament for a second time as Niemeyer won the semifinal encounter, 6-1, 6-2. Rik, however, won the heart of Hollyburn athletic director Caroyn Devine. They became engaged last Christmas. Photo 3: Anne Keothavong of Great Britain beat Stephanie Dubois of Quebec, photo 5, 7-5, 6-1, to win the Women's Singles trophy. Photo 4: Ashley Fisher of Australia, right in the photo, and Rik De Voest beat Donald Young and Alex Kuznetsov of the U.S., bottom photo, 6-1, 6-2, to win the Men's Doubles title. 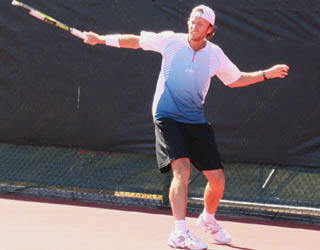 Ashley was the winner of the 2005 Men's Doubles title. Photo 5: Stephanie Dubois, a member of Canada's Federation Cup team, returning a forehand. Stephanie teamed up with fellow Canadian Marie-Eve Pelletier to beat Argentinian pair Agustina Lepore and Soledad Esperon, 6-4, 6-4, to capture the Women's Doubles title.